Back in January I entered three of my short stories for the Leicester Writes short story competition. Leicester Writes is a local literature development project; they run workshops, a writing group, competitions, and a literature festival, and are enthusiastic about supporting writers in Leicester and beyond. 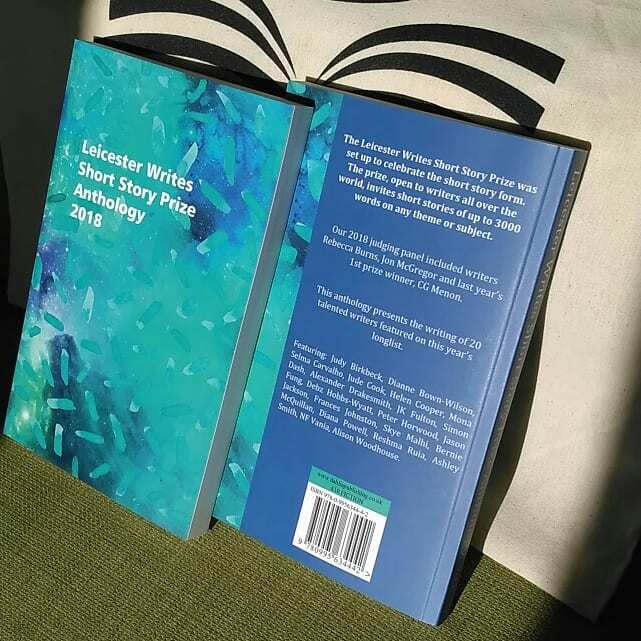 The competition was open to all writers across the world – but if you’re a resident of Leicestershire like me, you got a discount on the entry fee. Hence my three entries! I didn’t really have much hopes for my entries, but it had been a long time since I’d submitted anything anywhere, and I told myself that at least the entry fee was going to a worthwhile endeavour. So it came as a surprise when I got an email in April from Farhana Shaikh, the tireless organiser, saying one of my stories – “The Whisperer” – had been longlisted. It was even more of a surprise when she emailed again a couple of weeks later that my story had been included in the shortlist of 10 stories. The judging panel comprised last year’s winner C.G. Menon, short story expert Rebecca Burns, and Booker-listed and Costa-winning novelist Jon McGregor, all people who really know short stories, so I was delighted that they considered my story worthy of getting onto the shortlist. Yesterday, Sandra and I attended the launch at the LCB Depot in Leicester. I chickened out of doing a reading (I’ve done enough readings and appearances over the past couple of years to recognise that I really don’t like doing them) but it was great to hear some of the braver writers reading parts of their work. My writing is in a bit of a lull at the moment. I haven’t worked on any novels for a year and a half, and it’s been almost exactly a year since I finished a short story, so it was nice to have something positive to enjoy. It’s also given me a bit of incentive to work on Under the Mountain and Other Stories, a slim collection of eight speculative fiction short stories, illustrated by my friend Anh Diep, that I’m hoping to self-publish sometime later this year.